Moist to wet. Marshes, ditches. Full sun. This is a 3″ to 9″ tall, erect, perennial forb that rises on a single stem or cluster of stems from a thick, mostly horizontal, unbranched rhizome. It grows in muddy soil, often with its roots underwater. The stems are erect, stiff, unbranched, light green, hairless, and round in cross section. They are 3 ⁄16″ to ½″ thick in the middle, 1 ⁄16″ to ⅛″ thick near the inflorescence. The leaves are mostly basal, alternate, green, and linear. They are slightly concave on the upper side, convex on the underside. They are ⅛″ to ½″ wide, usually rising well above the flowering spike. They sheath the stem at the base and taper to a sharp point at the tip. They have parallel veins but do not have a prominent midrib. When fresh they are not glaucous. The inflorescence is a dense spike of minute staminate (male) and pistillate (female) flowers at the end of the stem. The staminate-flowered portion of the spike is above and separated by a ½″ to 4¾″ long length of naked stem from the pistillate-flowered portion. When in flower it is ⅜″ thick and about as long as the pistillate portion. The male flowers are straw-colored to medium brown. The pistillate-flowered portion of the spike is 2⅜″ to 8″ long and 3 ⁄16″ to ¼″ thick when in flower. When in fruit it is brown and ½″ to ⅞″ thick. The female flowers are dark brown at first, drying medium brown. The fruit is a thin-walled achene with hairs attached. 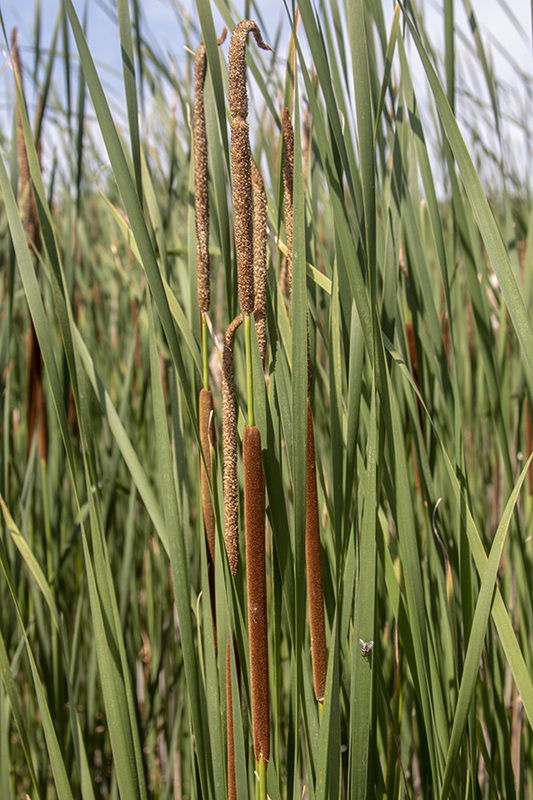 Broad-leaved cattail (Typha latifolia) has broader, green to grayish-blue leaves that are up to 1″ wide, flat, and extend only slightly above the flowering spike. The staminate spike of the flowering stalk is contiguous with, not separated from, the pistillate spike. When in fruit, the pistillate spike is 1″ to 1¼″ thick. 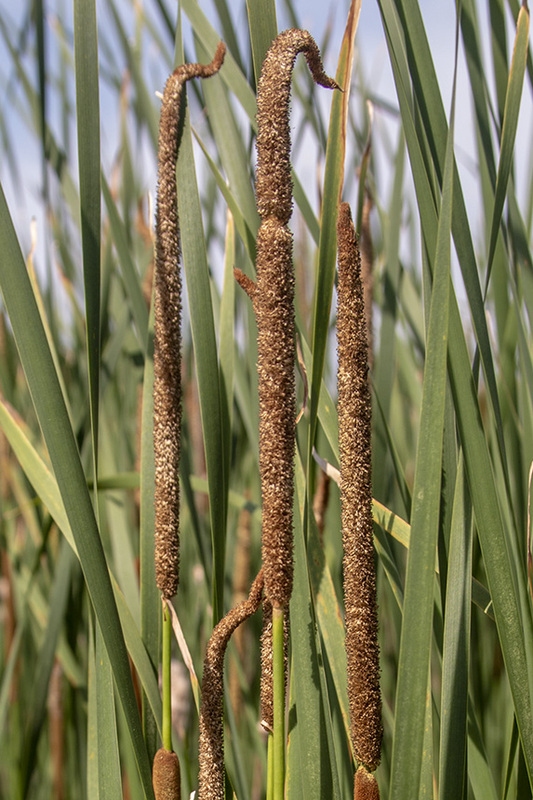 In places where both species occur broad-leaved cattail hybridizes with narrow-leaved cattail producing plants with characteristics that are intermediate between the two parent species. Though this is a native to the state some people consider it an invasive species. They argue that where it is introduced it soon crowds out other native species, often creating a monoculture. Neither the Minnesota Department of Agriculture nor the Minnesota DNR consider this an invasive species. 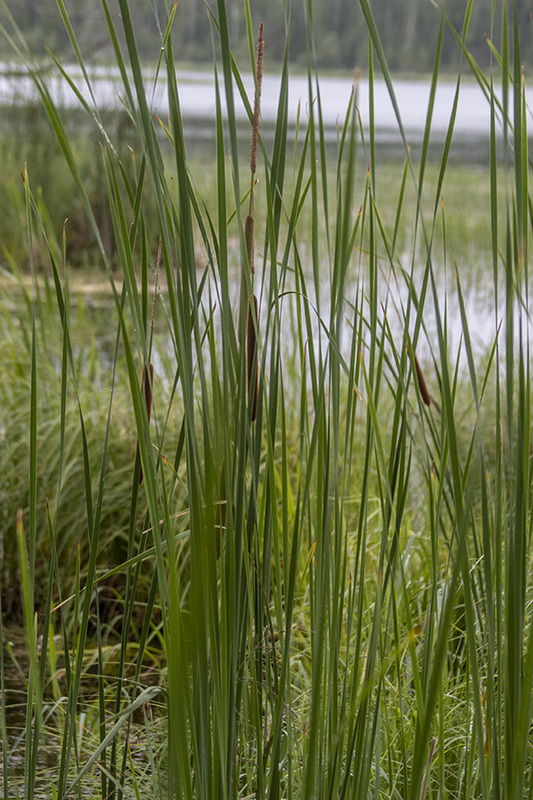 Typha angustifolia L., ( also Lesser Bulrush or Narrowleaf Cattail or Lesser Reedmace), is a perennial herbaceous plant of genus Typha. De kleine lisdodde (Typha angustifolia) is een plant uit de lisdoddefamilie (Typhaceae). 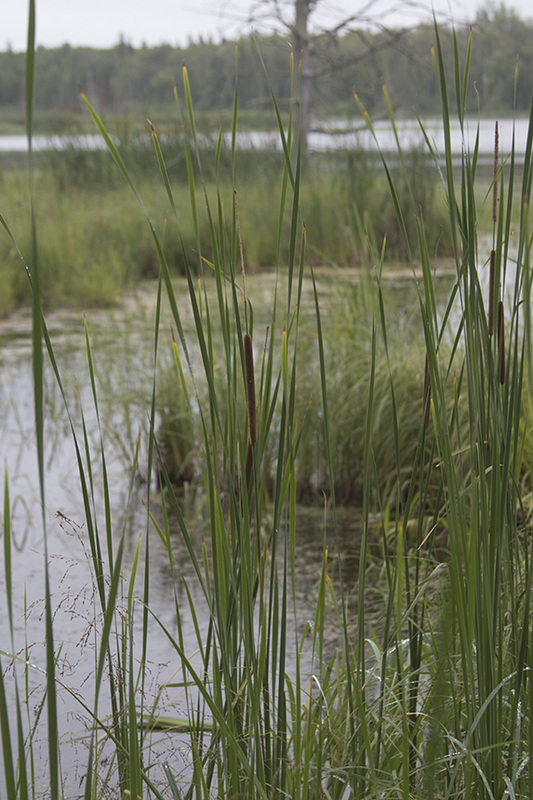 00:40 - HF461 (Benson) Mechanical control of hybrid and narrow-leaved cattail rulemaking allowed without an aquatic plant management permit. 35:45 - HF657 (Hackbarth) Spearing restrictions removed from lakes. 1:03:25 - HF896 (Persell) Requiring the installation of electric fish barriers. 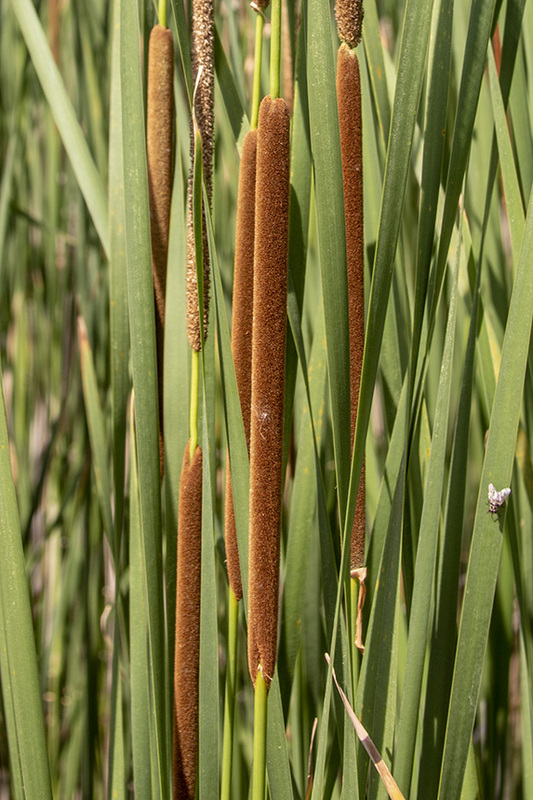 A comparison between narrowleaf cattail and common cattail as well as a comparison between hardsterm bulrush and great bulrush.